I am in the process of rebuilding this airplane. Initially, it did not appear to be worth the effort. Today, the fuselage is now very attractive. With the exception of more current avionics and micro-vortex generators, the airplane will retain the original interior and wheelpants. Of course, the systems (engine, propeller, vaccuum/gyros, brakes) will be overhauled and/or brought to airworthy condition. 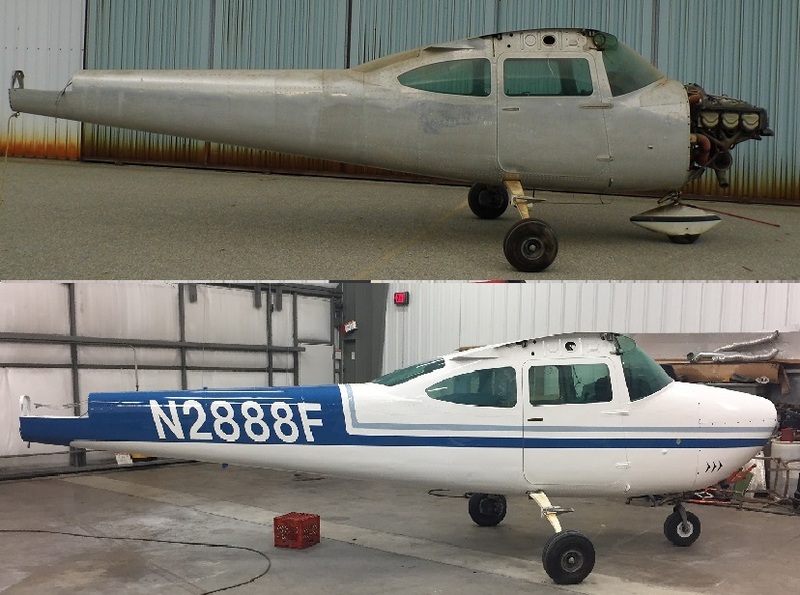 We are targeting a May, 2017, completion of a very attractive, vintage Cessna 182. This airplane is a 1967 Cessna C182 with roughly 1267 hours, total time. It was victim of a "hand prop" accident in 1975. I will spare the details, except to say the airplane was repaired, stripped, stored, extracted, cleaned and treated, and repainted. The wings are being replaced with wings of the same series with 2,503 hours total time. The donor plane came down hard on its nose and incurred enough damaage to total the airplane. Flying surfaces were not damaged. N2888F has been repainted to the original color scheme of the donor airplane to match the style and color of the flying surfaces.